The number of Americans in prison jumped over the past few decades amid the tough-on-crime policies of the “war on drugs” era. 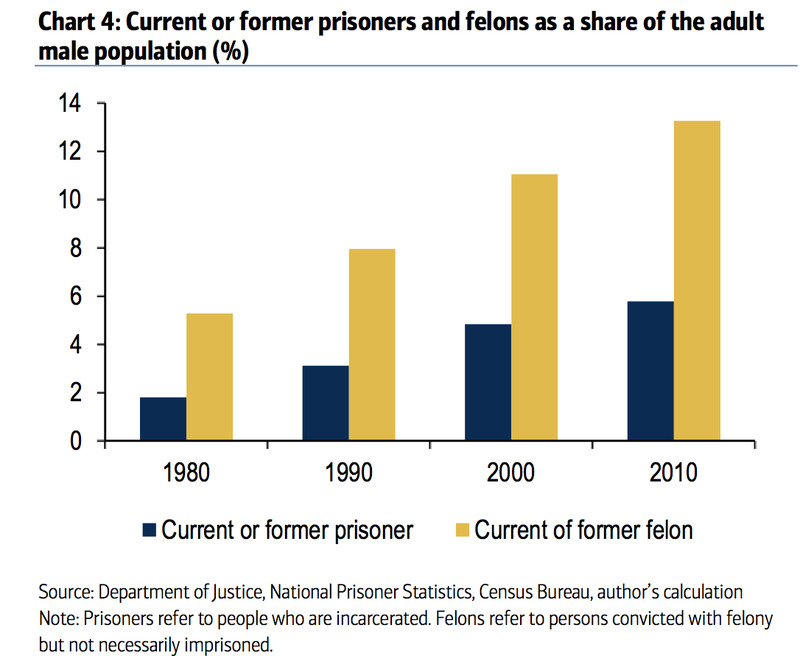 The share of the male adult population of former prisoners has risen from 1.8% in 1980 to 5.8% in 2010, according to data from Bank of America Merrill Lynch. High incarceration rates are likely to have contributed to the US’s decline in prime-age labour-force participation rates relative to other countries. The United States is an outlier when it comes to putting people behind bars. It has the second-highest incarceration rate in the world as the number of Americans in prison has surged over the past few decades amid the tough-on-crime policies of the “war on drugs” era. In a recent note to clients, Bank of America’s Michelle Meyer and Anna Zhou illustrated this with a chart showing current or former prisoners and felons as a share of the adult male population in the US from the 1980s through the 2010s. The proportions have increased substantially over the past several decades. According to data cited by Meyer and Zhou, the share of the male adult population of former prisoners has risen from 1.8% in 1980 to 5.8% in 2010. High incarceration rate policies have two key economic problems: They don’t create alternative and better opportunities for those living in communities with high crime rates, and they don’t address the question of how people should create new lives once they’re out of jail. And these high incarceration rates are likely to have contributed to the US’s decline in prime-age labour-force participation rates relative to other countries. “Incarceration policies affect participation rates directly by removing workers from the labour force for a period of time but also long-term as the stigma of incarceration can reduce demand for the labour services of the formerly incarcerated even years after their reentry into society,” the Council of Economic Advisers under the Obama Administration said last year in a report on the long-term decline in the US’s prime-age male labour force participation. In fact, people who have been imprisoned are 30% less likely to find a job than their non-incarcerated counterparts, according to the Center for Economic and Policy Research, cited by Meyer and Zhou. Occupational licensing rules or other restrictions on the hiring of those who have been incarcerated legally bar such individuals from a number of jobs, the CEA added. And even when there aren’t legal restrictions, employers are less likely to hire someone with a criminal record. Several studies have shown that when companies receive two job applications that are identical, except that one candidate has been in prison and the other hasn’t, the formerly incarcerated candidate is less likely to get an interview. A “potentially large fraction of this group is not participating in the workforce as a result of their incarceration, likely due to both discrimination and the degeneration of employment networks, resulting in long-term employment and earnings losses,” the authors of the CEA report said.